Shadow: Losing money gambling. Refusing to do your part to bring a plan to fruition. Taking a fatalistic approach to life. Fighting the natural course of events. Mythical/Spiritual: The God in the Machine. Deus ex Machina. Clotho, Lachesis, and Atropos. Fortuna. Story: An unforeseen event, completely out of the main character’s control, changes everything. Alternatively, decisions made in the past have unexpected present-day consequences. Relationships. You can’t plan every moment. Be spontaneous. Rather than strive for control, let go of the reins and see where the relationship goes. Check your behaviors. Are you reliving mistakes of the past? Work. Feeling a little de[as]ja[ag]-vu? Return to old files; new solutions might be lying dormant there. Ask yourself what this new opportunity has in common with older challenges. In analysis, take into account all influences, including those beyond your control. Spirituality. Behold the delicate machinery of heaven! As you watch events unfold, keep your perspective. What seems impossible to understand today will make sense with the passing of time. Look for the larger patterns. Personal Growth. The actions you take today will influence your reality for days and years to come. Making wise choices now can free you from the unpleasant business of enduring repercussions further down the road. Fortune Telling. Some events are in the hands of heaven. You’ve lived through this before. What happened then? The four evangelists. Four winds of heaven, the four corners of the earth, four seasons, four classical elements, four fixed signs of the zodiac, and four Gospels. Matthew, who looks human, traced the human lineage of Christ. Mark, the Lion, wrote of someone “crying” (roaring) in the wilderness. Luke, the Ox, focused on Jesus as a sacrifice. John, the Eagle, emphasized the mystical, higher nature of the Christ. What strategy would help you most: tracing roots, communication, sacrifice, or mystery? The great wheel. 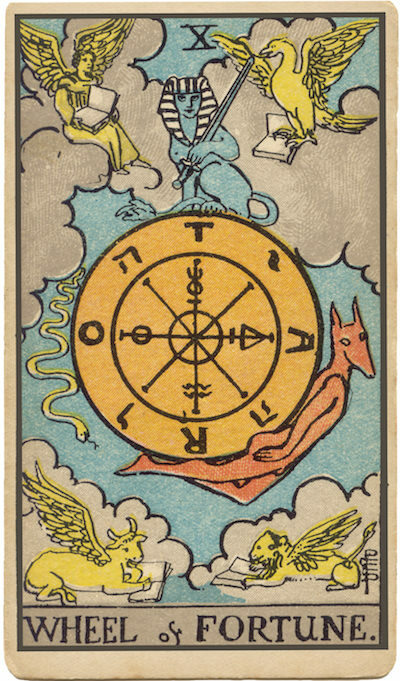 “To everything there is a season; a time for every purpose under heaven.” The wheel suggests the evolution of events, but also the cyclical nature of time and history. In your situation, what time has finally come? Symbols and letters. Using TARO as an alternative spelling, occultists came up with an anagram: TAROT ROTA ORAT TORA ATOR, or “The Tarot speaks the law of Hathor.”(Hathor was an Egyptian goddess of motherhood and love.) The Hebrew letters spell out the unspeakable name of God. The symbols are alchemical glyphs for mercury, sulfur, water, and salt. What might happen if you rearranged the basic elements of your situation? Fantastic beasts. The descending serpent or monkey once reigned. The Sphinx at the top now reigns. The ascending dog, or Anubis, will reign. Where are you in the cycle? How does this challenge fit into a larger pattern? What role does luck play in my circumstances? What can I control? How should I know when to relinquish control?